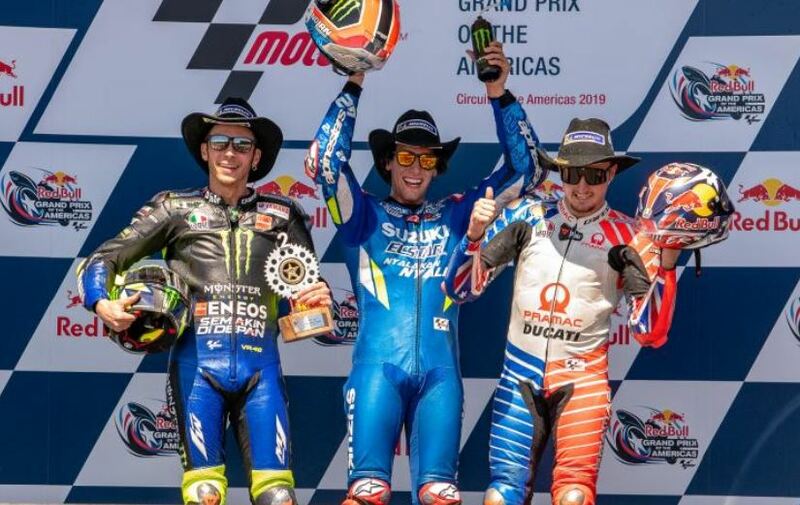 One of the trickiest tracks on the MotoGP calendar, the Circuit of the Americas in Texas, United States served up yet another sizzler. With some upsets, some surprises and some disappointments, this MotoGP weekend turned out to be quite a package. Here’s our summary of the 3 races. Like it almost always is the case, the battle at the front was fierce in the Moto3 race but it was Aron Canet who held his nerves till the very end. He took the lead very late in the race and won it ahead of Jaume Masia who missed out on his second win of this season by just a hair. Andrea Migno, who was also leading the race at a point of time, claimed the final step of the podium finishing ahead of Gabriel Rodrigo who finished in 4th. Niccolo Antonelli, the poleman, took the 5th spot in front of Tony Arbolino. Tony Arbolino, who qualified in the second place finished in 7th place despite some spirited riding which included the holeshot at Turn 1. Alonso Lopez, Celestino Vietti and Dennis Foggia took the 8th, 9th, and 10th place, respectively. In Moto2, Thomas Luthi returned to his winning ways after strong showings in the previous races. 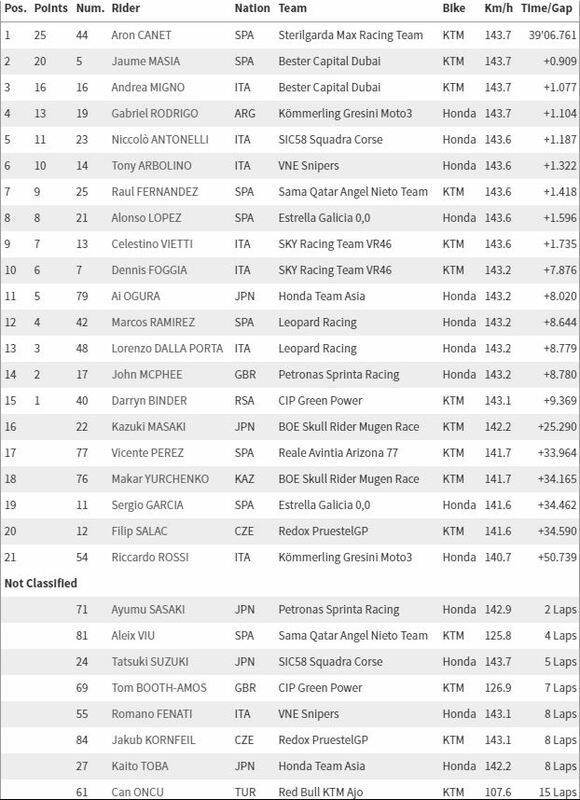 Luthi qualified in the 4th place after Marcel Schrotter, Alex Marquez and Sam Lowes, respectively. It was Alex Marquez who took the lead at the beginning of the race but Luthi and Schrotter were in hot pursuit and Alex Marquez was not able to open up a gap. Luthi remained patient and slowly ate into Marquez’ lead and after a few back and forth exchanges for the lead, Luthi finally took the lead and rode away to a victory. Marquez was then hunted by Schrotter and they had quite a few exchanges which also included a substantial contact between the motorcycles of the two. Schrotter, after taking the lead, went on to finish in the 2nd place. But it was Jorge Navarro who qualified in 6th, who showed tremendous determination as he slowly made his way through the pack. He finished in the 3rd place. The next surprise was Mattia Passini, the retired veteran who was to attend the race only as a commentator for Italian TV, who replaced the injured Agusto Fernandez and raced this weekend and boy, he did not show any track rust at all. He qualified in the 7th place but finished in the 4th place just ahead of Marquez who after a strong beginning faded to finish 5th. It is even a bigger deal when one considers the fact that Passini had no prior experience racing on these Triumph powered Moto2 machines! The winner of the previous two races of the season, Lorenzo Baldassarri crashed out early but still maintains the lead because of his previous wins. 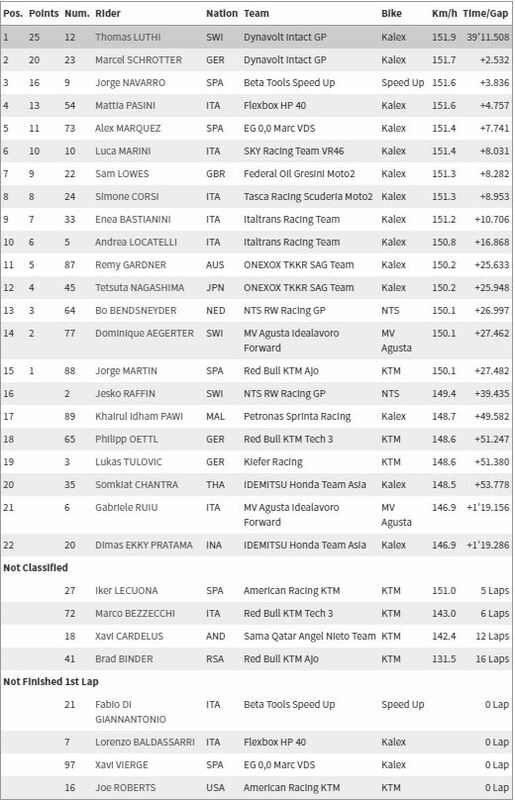 Luca Marini took 6th in front of Sam Lowes and Simone Corsi took 8th, which is where he was for the most part of the race. Enea Bastianini finished 9th in front of Andrea Locatelli rounded the top 10 of the Moto2 race at the Circuit of the Americas. Marc Marquez, who is referred to as the king of the Circuit of the Americas lost his throne in yesterday’s race. And a new king was crowned, Alex Rins, who won his first-ever MotoGP race. But the story of the race goes much deeper than that. As was expected, it was Marquez who flew away from the start of the race and was being closely followed by Rossi, Crutchlow, Miller and Rins. Another racer who got a flying start was Dovizioso who started from 13th and was in the 8th position by the time he reached second corner. Marquez was showing tremendous pace and Marquez began to open up a gap in the second lap. That happened as a result of Crutchlow hounding Rossi who began to ride a defensive line because of the charge from Crutchlow. Vinales and Mir were both given ride through penalties because both of them seemingly jumped the start. Things got worse for Vinales as by mistake, he took a long lap penalty and after realizing his mistake, pulled into the pit for a ride through. This saw him in the 19th place with 15 laps to go in the race. But this was just the beginning of the drama as Crutchlow who was giving a tough time to Rossi, crashed out in the same lap. Marquez already had a lead of 2 seconds by now, and in the next 3 laps he made it 3.5 seconds because after Crutchlow crashed out, Jack Miller started to push Rossi. And then came the moment which caused Marquez to lose the title of King of COTA. The back straight which sees blistering speeds and leads to the slow Turn 12 gave Marquez a taste of the gravel as he crashed out of the race probably because this is the bumpiest section of the track with the undulations at their maximum in the hard braking zone. He overcooked the corner and lost the front in a manner in which even Marquez cannot recover. That left Rossi in the front but Miller who was behind him was passed by Alex Rins who had started to pick up the pace now. Rins slowly reduced the gap from Rossi. With 4 laps to go, Rins made a smooth move on Rossi and took the lead which Rossi took back at Turn 12 but ran wide. Rins didn’t let go of the opportunity and took the lead for good and rode to his maiden victory. 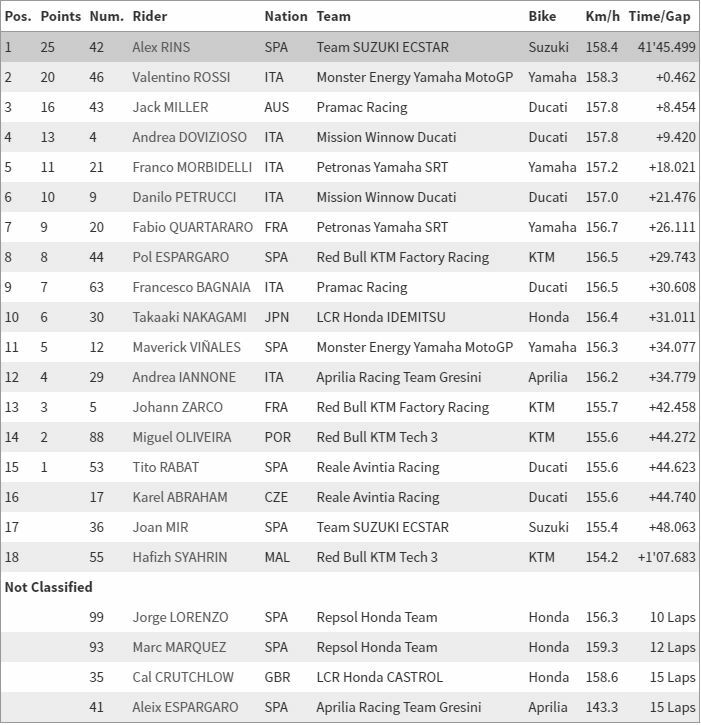 Rossi finished in the 2nd place and Jack Miller in the 3rd. Dovizioso had a tremendous race as he finished 4th after starting from the 13th place on the grid. Another notable feat for Rins is that now he is the only rider to win at COTA in all three classes. umeshp and RE "H" like this.